"1940 - UTAH - The Tourist Guide - Compliments of the Bureau of Information - Salt Lake City, Utah. " 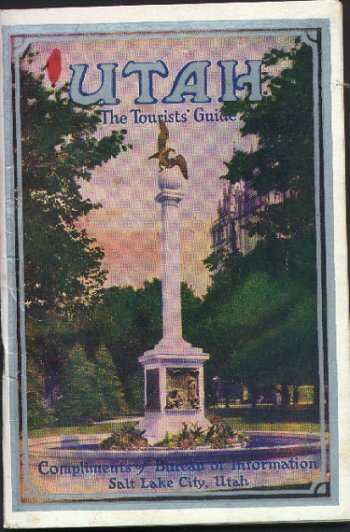 (941) 1940 - UTAH - The Tourist Guide - Compliments of the Bureau of Information - Salt Lake City, Utah. -Condition: Excellent This interesting tourist guide contains information on the History, People, Resources, Attractions, and Institutions in 1940 Utah. The first few pages are full page ads for Union Pacific Rairoad, Western Pacific Railroad, ZCMI (America's First Department Store), and the Rio Grande Scenic Railroad Line. There are some black and white photos throughout the booklet, and there is a full page (back cover) ad for The Hotel Utah on the back cover. The booklet measures 5" by 7 1/4" and has 96 pages. The pages are tight and in beautiful condition. There are a few small areas of discoloration on the back cover. Price: On Auction + shipping.